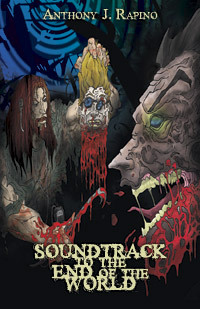 SOUNDTRACK TO THE END OF THE WORLD by Anthony J. Rapino is not your average zombie apocalypse tale. Perhaps in an effort to thwart the growing stagnancy of the zombie genre, it seems that lately people have been twisting the idea of zombies in new directions, and it is only by doing this that I believe they can succeed. That’s why Rapino’s tale had me hook, line, and sinker. The story follows Marty Raft, the huge but endearing friend and bodyguard of Corey, an amateur comedian. A few years ago, Marty saw his parents murdered and now tunes out of the world when things get too heavy by plugging into his mp3 player. The soundtrack that plays into his ears becomes our soundtrack as the story unfolds (sidenote: I think this would make a great movie. A zombie-killin’ anthem for metal-heads. I’d watch that). The two of them manage to get caught up in a strange new music scene that allows anyone who hears it to go “head-hopping,” or having an out-of-body experience. At first they think it’s a mass-drugging, but when they team up with Naomi, an aura-reader, they realize there’s more at stake here. Turns out, some people leave these clubs without their souls: abandoned bodies who drift around stupidly, or, as Marty calls them, stage-one zombies. An epidemic of these soon transform into stage-two zombies: the screamers. It’s a good thing Marty has his earbuds in most of the time because once the thread that attaches the abadoned bodies to their floating souls is severed, they become full-on ravenous zombies. The twist is that it isn’t their bite that harms you: it’s their unearthly scream. This book has the trifecta of a great read: interesting characters who you get to know and love, a unique and suspenseful storyline, and good writing. I enjoyed getting to know Marty and the crew as much as I enjoyed the new take on zombies as people whose souls have gotten lost in the ether, and the way the vibrations can affect us. It’s these different layers that make me appreciate the ways we can use horror for more than evoking feelings of revulsion and terror. Rapino delves into relationships, existential ponderings, the possibilities of pseudo-sciences like aura-reading, materialism, and the power of music. And he does all of this with zombies running amok. If you can hear the music, it’s already too late. So you might as well go read Soundtrack to the End of the World now. Interesting. One of the huge themes–or perhaps THE huge theme–underneath all zombie stories is the fear of being transformed into something that is not yourself. Reading this review has made me realize that portrayals of zombies change as a function of societal change and cultural concerns. In 1968, Romero’s “Night of the Living Dead” popularized the genre, and countless stories have followed in its footsteps. In Romero’s mythology, we only ever get one hint as to what created the zombies–radiation from a space probe returning from Venus. This sounds a lot like fear of nuclear war and even the threats of space exploration and the possibility of other life in the galaxy. In the majority of more recent zombie stories, a viral infection is to blame. This reads pretty clearly as fear created by the many epidemics and outbreak scares we’ve gone through in the past few decades. And now, perhaps, authors are revamping zombie stories because they’re not afraid of viral outbreaks anymore. It sounds like this novel is about the fear of what our own culture might do to us if we’re not careful. Technology is developing at an exponential rate, and we’re rapidly integrating it into our lives without stopping to think about possible repercussions. Perhaps we’re changing ourselves into something utterly foreign and life-destroying. That’s one take on the topic, anyway. In any case, you offered a thought-provoking review. Thanks for that. Hah! That would be awesome.